Forster knows Land Rover from his BMW days. MUNICH -- Carl-Peter Forster, who quit as head of General Motors Europe on Friday, is due to take charge of Jaguar Land Rover, the Sunday Times newspaper said. The paper cited sources in Frankfurt as saying that Forster was likely to be given a senior role at Tata Motors, which could involve him running the Indian automaker's British Jaguar and Land Rover brands, which Tata bought from Ford Motor Co. last year. The Sunday Times said Forster was sounded out about the job earlier in the year, and is expected to join Tata within a few months. The Financial Times reported on Monday that Tata wants Forster to help Jaguar Land Rover's plans to switch its product portfolio to low-emission vehicles. 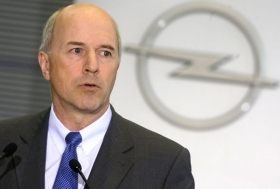 During his time with GM Europe Forster led a quality offensive at Opel and a move into low-emission and electric cars. Forster gained experience with Land Rover during his time as head of production at BMW in the 1990s when BMW owned the British SUV brand, the Financial Times said. The German weekly Focus also said Forster will join Tata but the magazine said he would lead the introduction of the Nano minicar in Europe in 2011. Forster quit GM after criticizing the U.S. carmaker for reversing a decision to sell its European Opel/Vauxhall unit to Canadian supplier Magna International Inc. and its Russian partner Sberbank. No one at Jaguar Land Rover was immediately available to comment. GM plans to replace Forster, who was GM Europe president and Opel's chairman, temporarily with Nick Reilly, former managing director of Opel sister brand Vauxhall in the UK and current head of GM's international operations, a GM source said. Reilly will remain president of GM International, the source told Automotive News.